Every once in a while when I was a kid, I’d wake up and wander downstairs and find chocolate milk and mini donuts sitting out for breakfast. I loved those days, because DONUTS AND CHOCOLATE MILK, right? Also, mini donuts meant my dad was home – he traveled extensively for work while I was growing up so having him home during the week was always something special. Sometimes he’d sneak off to the store before anyone else woke up and he always brought home the same thing: a half gallon of chocolate milk and a six pack of chocolate mini donuts and a six pack of powdered mini donuts. Since there were six of us girls, we only got two mini donuts each (I think he was trying not to give us too much sugar early in the morning! ), but those two mini donuts with a glass of chocolate milk was pretty amazing, especially considering the no sugared cereal rule at our house. So mini donuts have always seemed like something of a celebration to me! 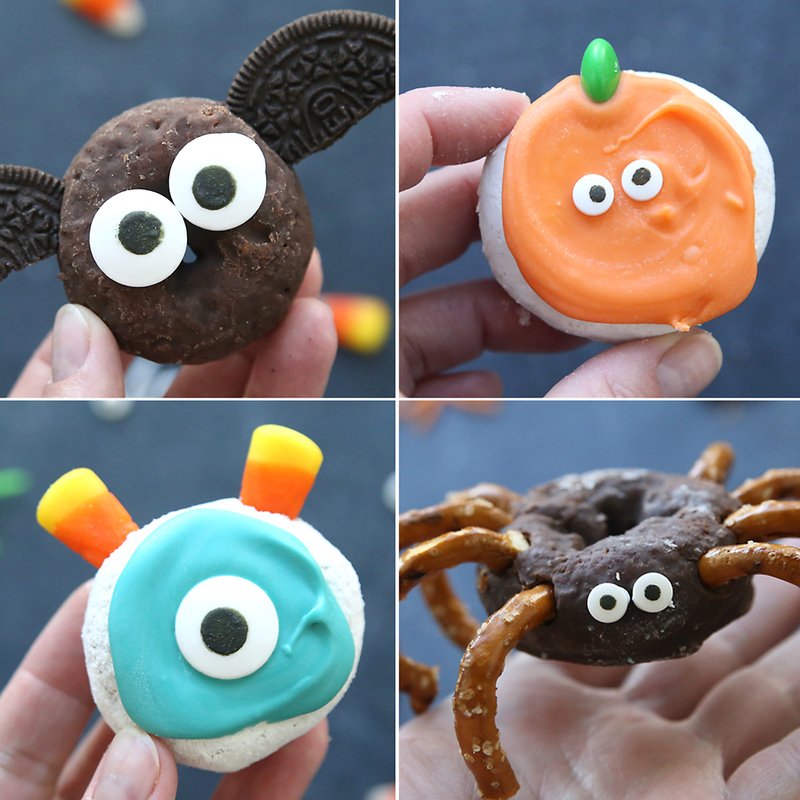 This week my kids and I turned them into Halloween donuts. We made a bat, a spider, a pumpkin, and a monster. 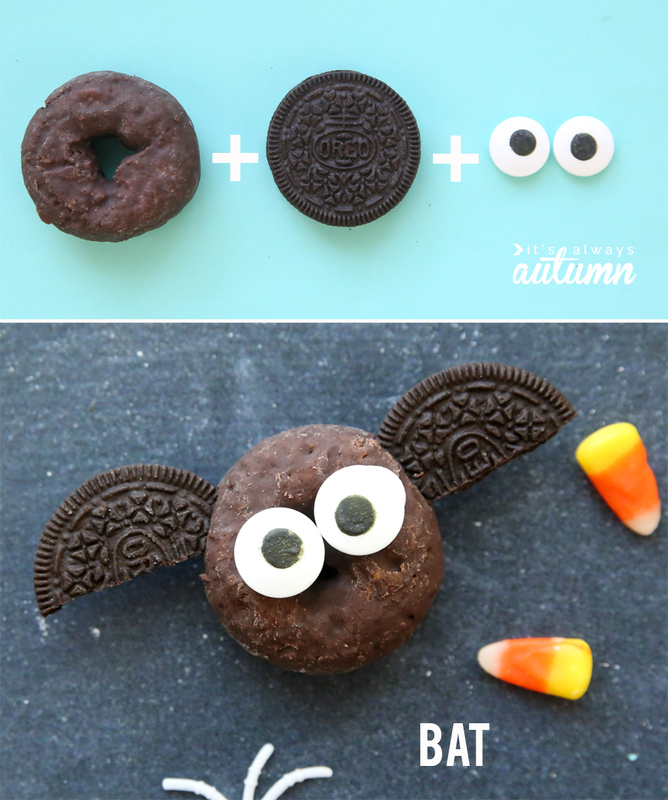 Click here for even more easy Halloween treat ideas! Super simple! 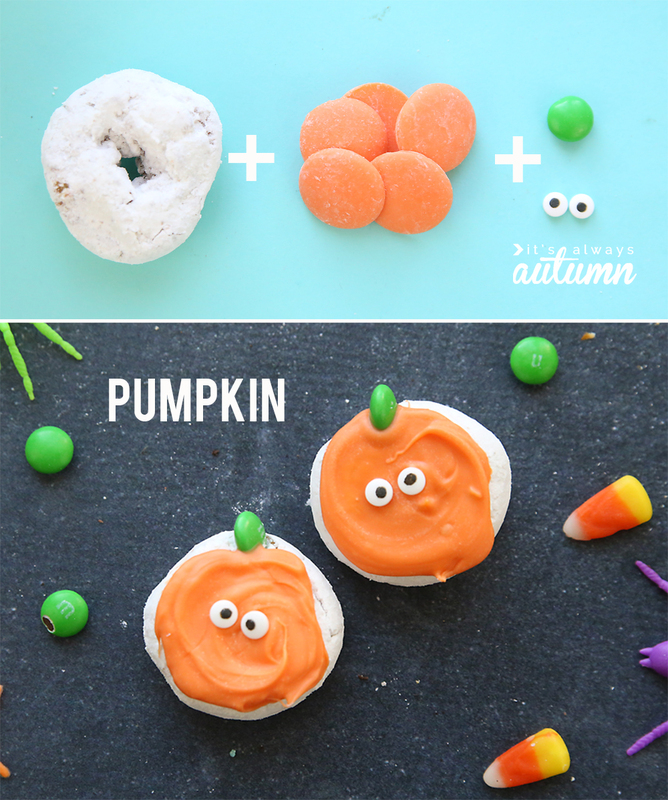 You only need three or four ingredients for each Halloween donut. Twist the two Oreo cookies apart. Use a large knife to slice one cookie in half, and stick each half into the donut to form wings. Put a few chocolate chips in a sandwich bag and melt them (alternately, use candy melts or some frosting – you can buy frosting in a tube near cake and cookie mixes). Snip a corner off the bag and “pipe” a little chocolate or frosting on the back of the eyes, then stick them on the donut. Melt the candy melts as directed on the package and spoon some onto the donut. Use the back of the spoon to smooth it. 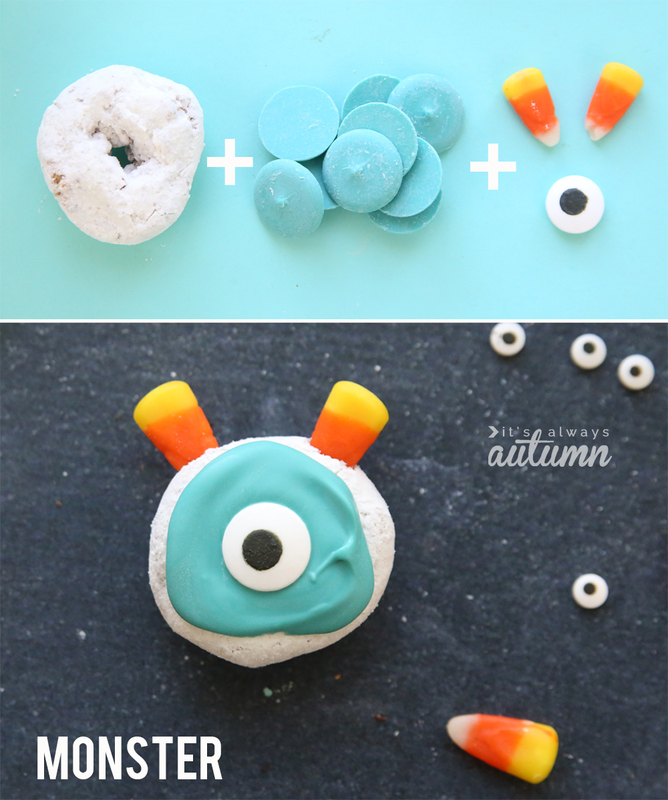 Top with a large candy eye, then stick two candy corns into the top for horns. Melt the candy melts as directed on the package and spoon some onto the donut. Use the back of the spoon to spread it. Top with two candy eyes and a green M&M for a stem. Try to find large pretzel twists, not mini ones (if you can only find minis, the Rold Gold brand are a bit larger and would work well). Use a sharp knife to cut the two longest curved portions of the pretzels off for legs. 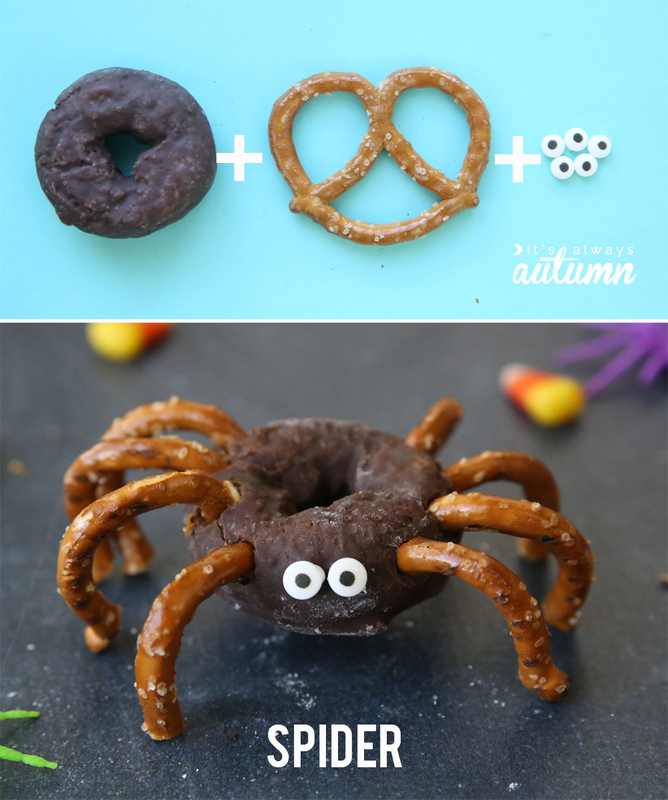 Poke eight legs into the sides of the donut, then attach eyes with melted chocolate or frosting. are they better than real donuts?